Hardly Pinterest-worthy is the picture below. In my meager attempts to live a shiny, compartmentalized, ‘I’ve got it under control’ kind of life, I sometimes forget what’s most important. As I made stovetop potpourri, God reminded me I should care care less about how I am perceived and more about how He is received. 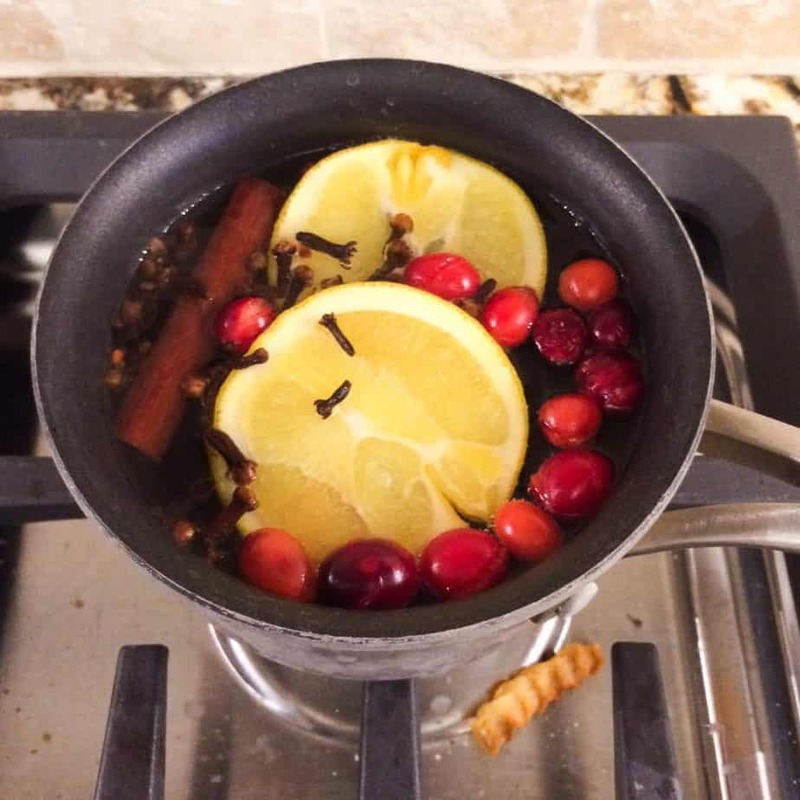 This post was going to include a recipe for Stove-top Potpourri and explain ways to get to know your neighbors during the holiday season, and it still does…sort of. After taking this shot, I took a second to look at the image. After realizing I cut the orange “wrong”, and that my lemons were too moldy to use, I noticed a sad, crusty French fry from last night’s gourmet dinner on the stove. Although some might see this picture as a Pinterest-fail, I was reminded that this is still a beautiful picture in God’s eyes. The word manifest means “clear, obvious.” With every sense, God wanted us to recognize the truth of who He is – that He sent His Son out of His great love for us to deliver us from sin. God made clear the truth of Christ by engaging us on every level – through sight, sound and touch. When the disciples saw that Jesus filled their nets with fish, when the woman was healed after touching His robe and when a little girl was brought back from death upon Jesus only hearing her story, Jesus made it clear that He wants to engage with us on every level possible. Christ doesn’t wait to help us until we get our act together, He faithfully engages us in our time of need. God wants us to come to Him as we are. He doesn’t care that we don’t have it all together (and no one does). He just wants us to show up and seek to engage with Him. The picture of my Stovetop Potpourri will never make it on the pages of a magazine…but it still counts. I still “showed up.” It brings glory to God as He knows my heart’s intent to build relationships with my neighbors to hopefully be a vehicle for His love. He doesn’t care that the process wasn’t perfect. Your Heavenly Father doesn’t want you “clean yourself up” before presenting your requests to Him. He wants to engage you in your greatest time of need and come as you are. He is delighted when His children “just show up”! Ironically, sometimes what we try to hide from others is the the very thing that can form a bridge to connect on an interpersonal level. Our Heavenly Father wants us to be transparent about the depths from which He has saved us. Thankfully, He doesn’t want us to engage with him as a sterile ‘my lipstick is always on’ version of ourselves and neither do our neighbors. 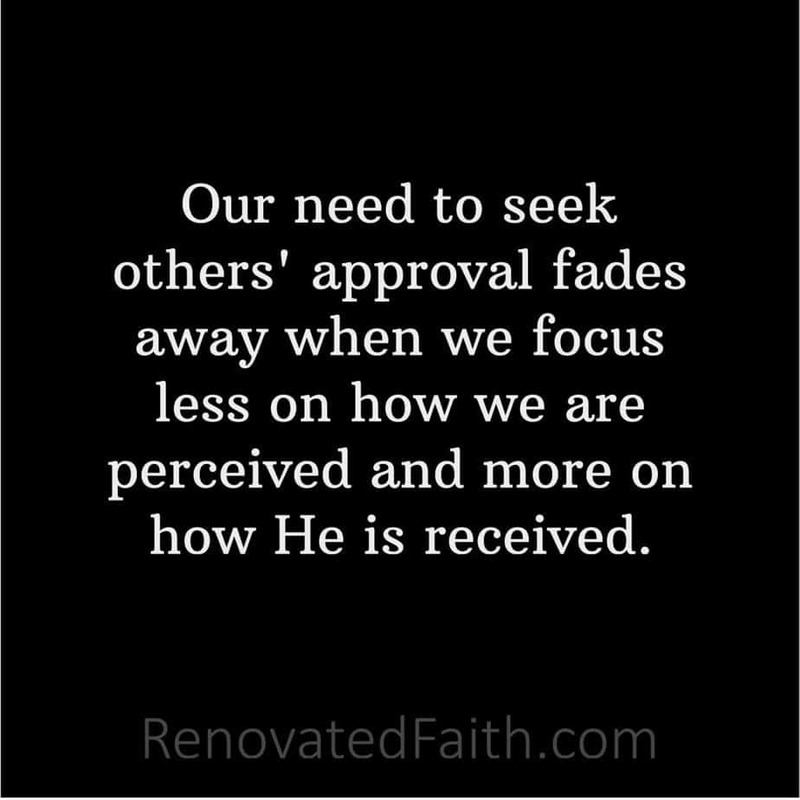 God seeks to engage you on every level so your focus shifts from how you are perceived to how HE is received. The Lord does not require us to be perfect but He simply wants us to be present. So often, a preoccupation with self dims that light that God so desperately wants to shine through us onto others. 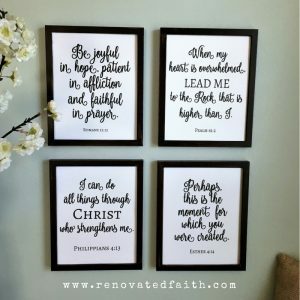 He wants us to be real with others about the difficulties and pain that life brings, knowing that God can heal our every wound and alleviate every fear. As in 2 Corinthians 2:15, may we be the “pleasing aroma of Christ among those who are being saved and those who are perishing.” The reality of ourselves might not always be pretty. However, there is an opportunity for our neighbors to see Him when the abundance of His all-sufficient love meets our own insufficiency. 2 cinnamon sticks – The cheapest I found are these at Walmart. I also like to add a few drops of an essential oil blend called Germ Fighter. It is basically just cloves, lemon and cinnamon, giving the potpourri a stronger smell. I also make hand sanitizer with this oil blend by adding about 10 drops to 1/4 cup aloe gel. 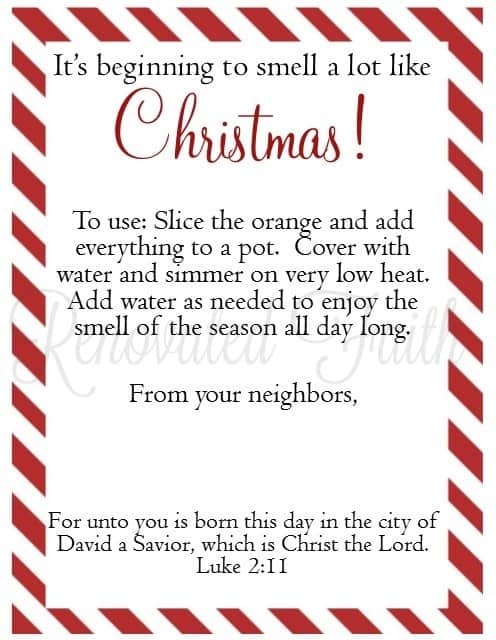 It kills germs and smells like Christmas! Who could ask for more?!? 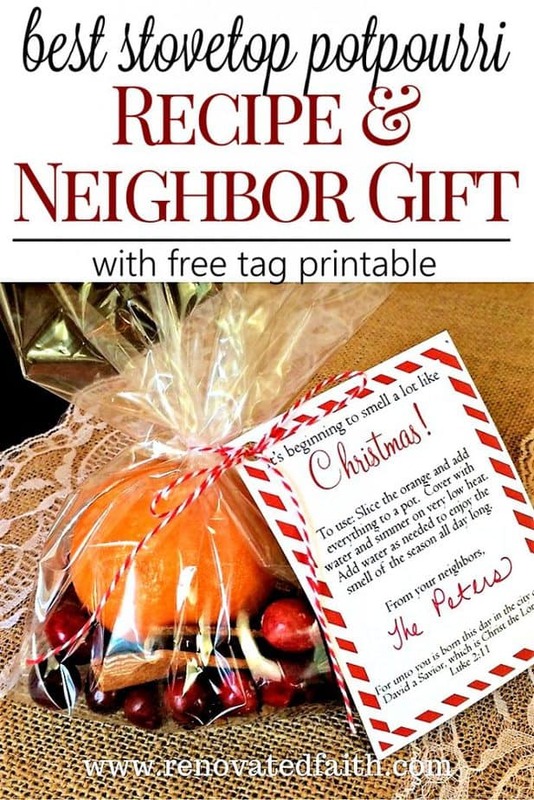 By subscribing to the blog you can access my free Stovetop Potpourri gift tag, by signing up HERE. If you are already subscribed, go HERE and use your password at the bottom of your last newsletter. 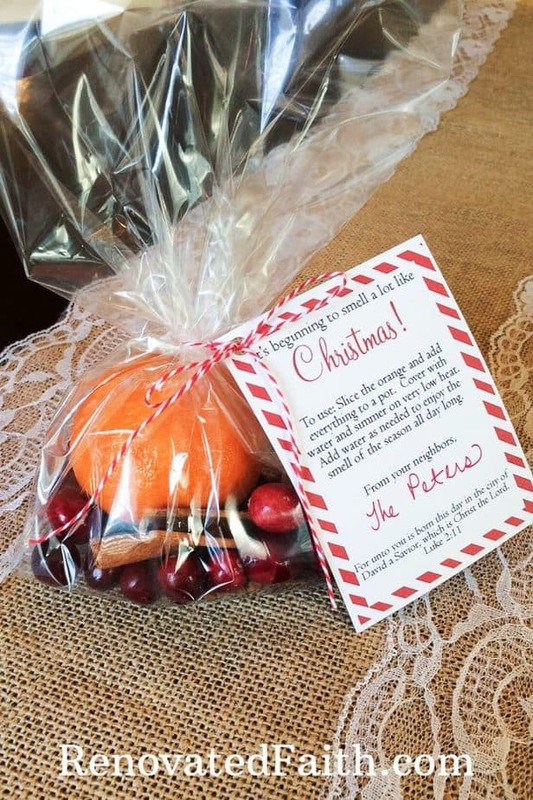 I tied them with baker’s twine and my daughter and I had fun putting them in each neighbor’s mailbox! They have been a big hit so far! This post was so amazing, thank you for being open to share what God has for you to share instead of the perfect Pinterest picture. So blessed by it! Thank you for being so open to what God has to shared, I’ve been so blessed by it! Karin-this is so refreshing! Thank you for your transparency and encouragement. Authentic living with our families and our neighbors. Presence over perfect. Thank you sharing! I need this ALL YEAR LONG! This was so refreshing to read! Thank you for being so transparent. I sometimes need reassurance that I’m not the only one living an imperfect life. Everything in social media is so curated and edited that I can feel “less than.” Blessings to you!